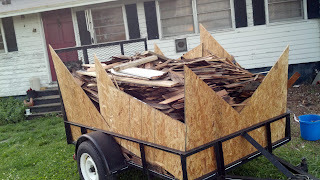 Since we asked the roofers to save as many of the 100+ year old cedar shake shingles that were underneath our old metal roof, we are now working on relocating them to a storage area in on of our barns for later use. We aren't quite sure what we will do with them yet, but we couldn't bare trashing them knowing how old they are. This photo of our full trailer is only about half of what we saved. What would YOU do with them? I think I am going to talk The Boy into making some wild bird houses out of them, maybe some new bat houses too. He's mentioned possible using some as a roof for a small shelter we've been mulling over. Several of them are broken and are in strips, but an amazing amount of them are still whole and perfectly usable... for something. I would make some chicken coops with them , or line a closet with the ones in better shape. Ahh love the smell of cedar. Good idea! Recycling has always brought good benefits both for the owner and for the environment. You could actually cut costs when buying materials for the project you’re planning, and, at the same time, reduce the amount of trash in the environment. I agree with Cody. 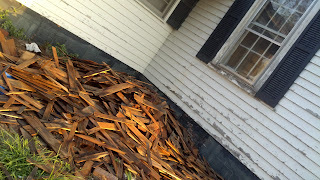 One big benefit of a cedar roof is its durability. Aside from being resistant to different weather elements, cedar shingles also resists insect and UV damage naturally. Likewise, it serves as a natural insulator, keeping your house cool or warm and helps you reduce energy costs.